Twilio, the tech company that had a blockbuster IPO last week, is on fire again. 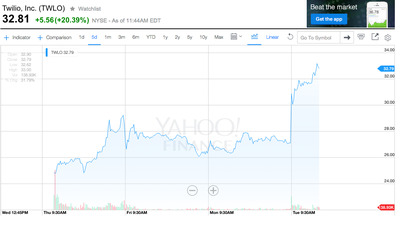 Shares of the company, which makes communications software, are up 21% in mid-day trading, at $33 — a new high. The broader market is enjoying a bounce-back on Tuesday, after the massive sell-off triggered by the “Brexit” vote last week. But Twilio’s pop is much bigger than the Nasdaq Composite’s 60 point increase, which is about 1.3%. And Twilio’s gains on Tuesday far exceeded its lost ground, about 5%, over the past couple of days.